Green Roads is an excellent choice for those looking for a full spectrum oil without any risk of THC in their system. The company’s CBD manufacturing process is incredible, as they only use organic hemp that has been cultivated to the highest standard. The Daily Dose 1500 mg formula is one of their most popular products. This product is often used for pain relief, anxiety, stress, epilepsy, and crohn’s disease. Green Roads are a Florida based company who produce CBD oils and other products that are designed to help you alleviate stress, chronic pain, and anxiety, among other medical issues. Starting off as a relatively small business in 2012, they have expanded rapidly within the last few years and currently have over one million users and 5,000 wholesale clients. The daily dose 1500 mg formula is a high concentration of CBD, and each syringe has approximately a 50 mg concentration of CBD. It has a floral, rich in hemp and lightly sweet flavor. This a sublingual oil that is vegetable glycerin based and has been infused with pharmaceutical-grade CBD. option. 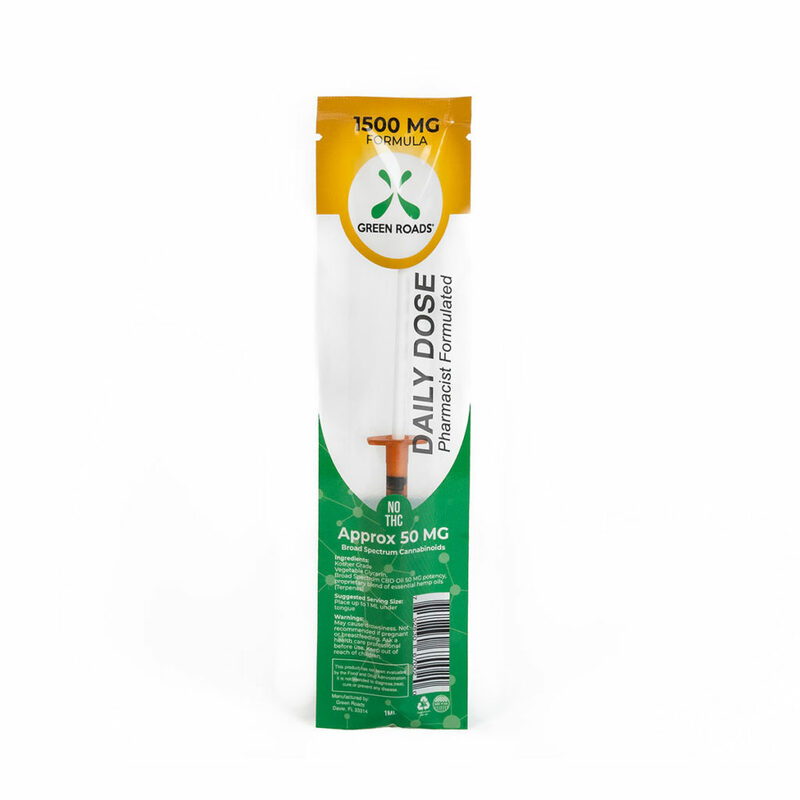 The major advantage of the daily dose products is that there is no need to measure your dosage – it’s all worked out for you so you simply consume it straight from the syringe. This is what makes this option so convenient and user-friendly. The daily dose formula products are also available in 350 mg and 1000 mg options. The 1500 mg formula is for sale on the Green Roads website for $11.99. There are great consumer reviews on the site and, by all accounts, this product seems to be selling really well. The daily dose 1500 mg formula is a great alternative to the 1000 mg formula for those who are looking for something a bit more potent. This is a quality product and very convenient for people who move around a lot on a daily basis.